Lenny loves runny eggs. He loves runny eggs on everything from pizza to salad. 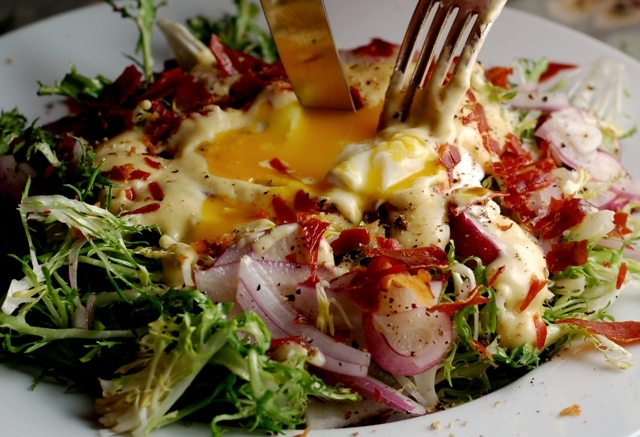 I knew when I saw this recipe for Egg Benedict Salad, in the January issue of Bon Appetit, that it was a winner. It is a spin on a tradition French frisee salad which we enjoy often. The base of the recipe consists of frisee, radishes, thinly sliced red onion and edamame which is then tossed with a light vinaigrette of white balsamic and olive oil. I forgot the edamame so it was left out this time around. I was thrilled to read that the dressing for the salad would be a classic hollandaise sauce. I LOVE hollandaise sauce that is prepared perfectly – real eggs, fresh lemon juice, and butter. This recipe was definitely easier then the recipe I use as it called for adding melted butter, which was gently whisked in, then it was heated over simmering water. The twist to this dressing was that you add Dijon mustard at the very end. After gently poaching eggs, I laid them on the bed of frisee, lightly drizzled it with the hollandaise sauce and crumbled crispy pieces of prosciutto over the top. The only thing missing from this fantastic meal was a bottle of wine and a warm and crusty baguette. Fill another large bowl with cold water. Pour enough water into large skillet to reach a depth of 1 1/2 inches. Add 1 teaspoon coarse salt; bring to simmer. Crack 1 egg into each of 4 custard cups or small bowls, keeping yolks intact. Gently slide eggs into simmering water. Cook just until whites are set, about 2 minutes. Using a slotted spoon, transfer 1 egg at a time to prepared bowl with cold water. Reserve skillet with water. DO AHEAD Prosciutto, vinaigrette, salad, and eggs can be made 4 hours ahead. Cover prosciutto, salad, and bowl with eggs separately; chill. Let vinaigrette stand at room temperature; whisk before using. Whisk 2 egg yolks and lemon juice in a medium metal bowl. Gradually whisk in melted butter. Set bowl over medium saucepan of gently simmering water (do not allow bottom of a bowl to touch water). Whisk constantly until mixture thickens and an instant-read thermometer registers 140°F for 3 minutes, about 5 minutes total. Remove bowl from over water; whisk in last 3 ingredients. Cover to keep warm. Toss salad with vinaigrette. Divide among plates; sprinkle with prosciutto. Bring skillet with water to boil. Using a slotted spoon, slide poached eggs back into skillet; cook until heated through, about 1 minute. Using a slotted spoon, divide eggs among salads. Drizzle with hollandaise. 12 Responses to "Eggs Benedict Salad"
Wow. This will be on my dinner plate sometime in the next week. Beautiful photo! I also share Lenny's love of runny eggs. And hollandaise sauce makes everything better. I am a runny egg fan as well, and this looks perfect! How interesting! This sounds like a much tastier, kicked up alternative to Salad Lyonnaise. Very cool. My type of salad too! Fantastic idea!!! Mmmm I love runny eggs too and this is gorgeous! Over from twitter This looks fabulous and my husband would be in heaven! He's another runny egg lover.